An enormous and ominous coronal hole on our Sun has turned and is now facing Earth along with a smaller hole also facing Earth and both are releasing a ferocious barrage of solar wind heading for our planet at incredible speeds. 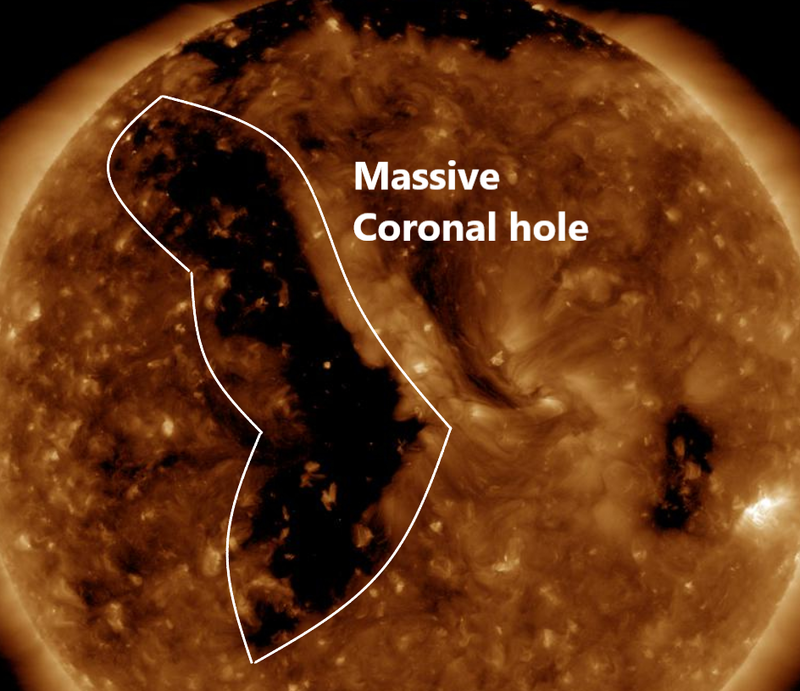 Solar wind flowing from this large coronal hole should reach Earth on Oct. 7-8. The intense solar wind from the smaller hole on the right is impacting Earth's magnetosphere right now, lasting until tomorrow. Each hole is spewing a stream of solar wind toward our planet at around 1 million mph. This could be significant for The Pacific Ring Of Fire especially the Indonesia area where the people are recovering from the M 7.4 quake and tsunami last Friday, many scientists now believe these coronal holes have a large influence on quake and volcanic activity on our planet, we will see.